Facebook ads allow you to reach your most interested customers, and send them to your website. In fact, on average, Facebook ads reach 89% of an advertiser’s intended audience. This means you’re only reaching the people who matter to you. Building a Facebook ad campaign can take a significant amount of time during the initial start up period. You’ll have to work with a strategy team to define targeting, then coordinate with a graphic designer to build creative, and finally program the campaign once you have all of your assets. As a Social Media Content Creator at Efferent Media, I spend a lot of time building creative for ads. It can be a lot of fun, but there are a few rules in place that I need to follow in order to execute creative for any of our campaigns. The first – and maybe most important thing – to keep in mind is Facebook’s 20% text policy. This policy states that any ad or sponsored story may not include images with than more than 20% text. To explain a little further, images that are zoomed in on logos/text and images that are clearly edited to include text, will be scrutinized under this policy. While this rule can sometimes be very frustrating, it’s not impossible to work with. Thankfully, Facebook has created the Grid Tool to help us. 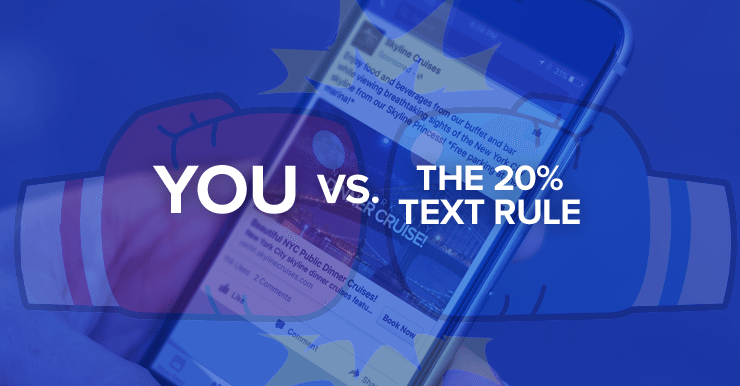 This tool allows advertisers and their teams the ability to upload creative, and see if it’ll pass the 20% text rule before building an entire campaign. Even though this can be helpful, it can still be tedious as you play trial and error. To make this more efficient, you can create your own Grid Tool in Photoshop. Open Photoshop and go to Edit < Preferences < Grids, guides < Slices. To stay within the 20% range, Facebook suggests using five boxes or less when adding text. In addition, you should also make sure the creative in all of your ads follow Facebook’s other advertising guidelines. You can read them here.